This exclusive but still classical wooden house is majestically situated on top of a little hill and with comfortable distance to Lahällsvägen below. You park outside the door and a couple of steps later, you enter the hallway where you have a bathroom on your right hand side with a sink, shower, washing mashine and tumle dryer. Still on the bottom floor, further down the hallway, you find a bedroom with 1 bed (120 cm) and space for an extra bed if you wish. There is a door leading directly to the garden where a big trampoline, swing and ping pong table is waiting for the kids. Outside this room, you'll also find a separate WC. Once you've climbed the stairs, you have a spacious livingroom on your right, kitchen just ahead and a separate dining area on your right. The livingroom is equipped with tv with rich offerings from three satellites (Astra, Hotbird and Thor) and in several languages. The kitchen is highly modern and you will find everything you can ask for: a JURA coffee machine makes you freshly grinded coffee, microwave, convection oven, induction stove and big fridge and freezer. Or you may prefer to throw a barbecue on the 200 sqm big terrace to which you have direct access to from the kitchen. Outside the living room you have the pool 4x8 m, 1,5 m deep and heated, keeps around 26 degrees Celcius. There is also a spa bath with room for 6 people, 38 degrees Celcius. On the deck you have a dining place for 7 people, sunbeds, longe furnitures, parasol, Weber Grill and toys for outdoor and pool activity. In the garden there is a trampolin, a small climbing frame with a swing and a ping-pong table. If you climb the next staircase, you enter the bedroom section, well seperated from the daily activities on the mid- and bottom floor. Here, you also find a bathroom with shower. One of the bedrooms provides a bunk bed, excellent for children! The Master Bedroom is spacious with big wardrobes and web-tv/Netflix. The house is equipped with a high-speed fibre-optic Internet connection and indoor WiFi-connectivity is provided by a high-end ASUS RT-AC88U router. We are very flexible to your wished and how you wish to arrange the rooms and number of beds. Bed linen, towels and final cleaning is included. Check-in/Check-out day is Saturday, weekly rental. Marianne and Fredrik. Happy parents of our triplet boys Jonathan, Michael and Christoffer. Summertime we spend a lot of time in our cottage on the Island Gotland and therefor we choose to rent out our villa to you! Swimming pool and good communications. We stayed at this accommodation in early August 2017 with our three children, and had a fantastic 2 week holiday. The house has 4 bedrooms and is split over three levels and is beautifully decorated. The lounge and dining room are a great size and the property has 2 large bedrooms and 2 smaller ones. Easily the best feature is the large private swimming area, with a hot tub, BBQ and comfy furniture. Our kids spent numerous days in the pool when the weather was warm enough. We didn't hire a car and instead used public transport, which was easy. There is station a few metres from the house, where you can catch the train into Stockholm centre in less than 30 minutes. The train service was great. We also caught the bus to the ferry terminal to spend some time on the islands. Fredrik & Marianne where perfect hosts. Great communication before the trip, and where only a text away whilst we where in Stockholm. Thank-you for a memorable holiday. Exactly as promised - charming! Wonderful location and the house is roomy. You will love it! It was ***our*** pleasure to have you here! If you want to visit Sweden ,you cannot loose to stay in Marianne`s paradise. The owner Marianne is the best kind person you could find to know everythings about her house and about the near utility. The location is wonderful as the photos on line shown. We are two families (8 people) so if you want to do a shower ,unfortunately you had to wait a long time if the others guests have just used it. This is the only problem ,we have found....perhaps we are a lot of. We recomanded this house even for the next train station to go to.Stockholm in 20 min. Une maison parfaitement équipée et pleine de charme située à 20 minutes du coeur de Stockholm en tramway. Marianne & Fredrik sont très attentionnés. La grande terrasse en bois surplombe une rue très calme, on est au milieu des arbres. Ein Sommerurlaub, der unseren Vorstellungen vollauf gerecht wurde! Die Wohnung entsprach voll und ganz unseren Erwartungen! Die Einrichtung ist auf aktuellem Stand, wir haben alles sauber und adrett vorgefunden. Das Haus liegt an einer verkehrsberuhigten Seitenstr., somit war kein störender Autolärm wahrnehmbar. Die Nahverkehrsanbindung zur Stockholmer City ist nur 3 Gehminuten entfernt. Die Begegnung mit den Folkerts hat von Anfang an sehr gut funktioniert: die Kommunikation, die Zahlungen, den laufenden Kontakt und sympathisches Verhalten. Wir können sie definitiv als Gäste empfehlen! War die Freude pur sie als Gäste in unserem Haus zu begrüssen! Fijne woning met leuke indeling. Goed uitgeruste keuken. Heerlijke veranda met zwembad en jacuzzi. Huis is schoon met een fris interieur en handig ingedeeld. De kinderen (4) hadden hun eigen game/slaapkamer beneden, de ouders sliepen boven. Een tweede tweepersoonsbed werd wel gemist. Keuken was erg goed uitgerust. Woonkamer met fijne meubelen en een goede tv viel erg in de smaak. Buiten op de veranda hebben we het meest gezeten. Lekkere eettafel waar 8 pers aan konden zitten en genoeg loungebanken. Zwembad en jacuzzi waren erg lekker. Zwembad was niet erg diep max 140 maar voldeed prima. Heerlijk dat we alles mochten gebruiken vsn de eigenaars. The most striking first impression of Lahäll (the southern-most area of the municipality of Täby) is nature and silence: foxes and deers have been sighted in the neighborhood, the birds' singing is clear but never disturbing. Still, you are only 5 minutes away from the modern Täby Centre with 160 shops, restaurants, take-away, fashion and movie theatres and less than 10 minutes from Stockholm City with internationally recognized Swedish Cuisine. Connections are excellent: the highway E18 is just 600 m. away or the train ('Roslagsbanan') which takes you to Stockholm City in 15 minutes. 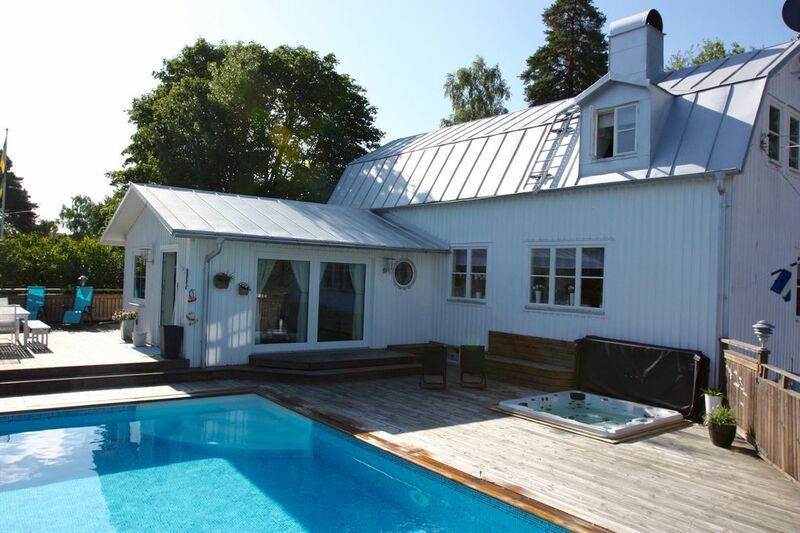 You may want to play golf at the fashionable Djursholm Golf Course or take a jog in the forrest right behind the house - it's all there at your conviniece!